All the right Con-chords will be played as this year’s popular Christmas Carol Concert returns to the Fleet Air Arm Museum on December 13th and 14th. Visitors can join the HMS Heron Royal Navy Volunteer Band under Concorde 002 in Hall Four of the Yeovilton museum. The concert features several classics and festive numbers for the occasion. Doors open at 6.30pm, the concert starts at 7.30pm. 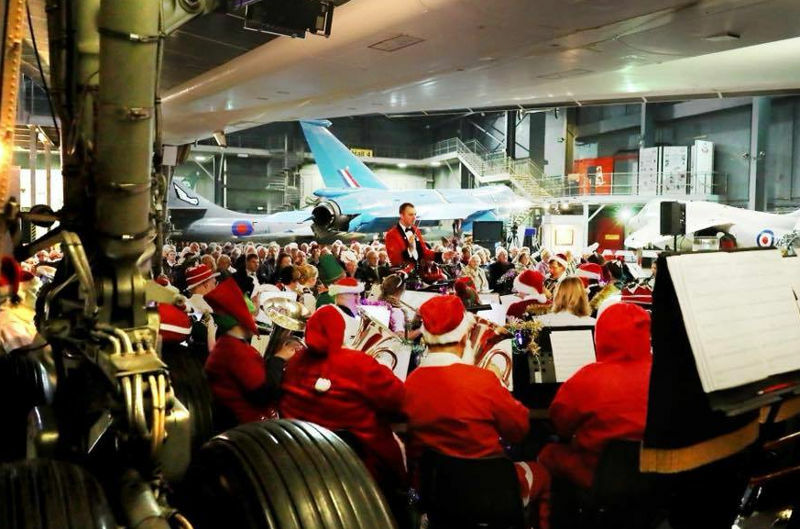 General Manager of the Fleet Air Arm Museum, Marc Farrance, said: “Our Christmas Carols are very popular and they’re held in such a unique setting – under the Concorde 2. “We are delighted to host the HMS Heron Royal Navy Volunteer Band for another two evenings of fun and entertainment. “The event has been incredibly popular in recent years. We now hold it over two nights to make sure no one missed out on tickets and this year will be the same. It is strongly recommended that those wishing to go purchase their tickets in advance. Ordered by Air Ministry from Hawker Aircraft Ltd, contract no.943/SAS/C.23 (A). Sub-contracted by Hawker Aircraft Ltd to Gloster Aeroplane Co Ltd, sub-contract no.B.12148/39. Glosters built all but 15 of the 3,317 Typhoons built. 1944 Built by the Gloster Aeroplane Co Ltd at Hucclecote, Gloucester. Fitted with 2,180hp Napier Sabre IIA Engine. Given airframe No.153219. Part of Typhoon batch MN229 – MN269 which formed part of the 5th production batch of 800 aircraft, delivered Dec 43 -Jun 44. O8 Feb 44 First flight at Hucclecote Aerodrome, Glos – a 40 minute flight flown by Squadron Leader Allan H Smith DFC, serving as a test pilot for the Gloster aircraft company on rest after completing his first operational tour with No 486 (NZ) Squadron. Squadron Leader Smith later commented that it must have been a good aircraft because he signed it ‘off test’ for delivery to the RAF after 40 minutes flying without any faults that would require another test flight. See logbook copy DoRIS ref. MF10029/12. 16 Feb 44 Off contract and allocated to 51 MU Lichfield, Staffs for storage. Mar 44 Allocated to USA for flight evaluation, in response to a USAAF requirement to investigate the Typhoons’ potential as a fighter-bomber and to increase its fuel capacity. 12 Mar 44 To 47 MU RAF Sealand, Cheshire for packing. 24 Mar 44 Shipped to New York on the `SS American Manufacturer’. 16 Apr 44 Arrived in New York. Last entry on movement card. After arrival in the United States the Typhoon was intended for fighter comparison and evaluation trials by the USAAF. On an unknown date it was issued with the Flight Test evaluation serial number T2-491/FE-491, though it is thought that it did not fly with this number applied. The `FE’ stood for `Foreign Experimental’. The aircraft was evaluated at Wright-Patterson Air Force Base, Dayton, Ohio. Due to changing requirements the Typhoon did not undertake the test programme originally envisaged and following a minor accident after only nine hours flying was put into store. Examination of the aircraft as part of the assessment of its condition after 21 years at Hendon revealed that on the starboard side of the cockpit there is a small wooden container marked `Airplane Defect Reports’. The aircraft also carries, on the reverse of a removable panel below the cockpit (port side) a `Data Case’ that has the following pencilled on it: `P38-G-3-LO, Aircraft 42-12791′. If this is indeed from a P-38 Lightning then these would seem to be two small modifications made by the Americans during their brief evaluation of the aircraft. Jul 44 Noted at Freeman Field, and photographed 6 Jul 44 after assembly. Photo assembled in USA – Aeroplane June 2004 p.82. 24 Jul 46 Again at Freeman Field. Engine prepared for storage. Total flying hours – nine. 03 Jan 49 Allocated to the National Air Museum and eventually placed in crated storage at the reserve collection of the Smithsonian Institute, Washington. Apparently never on public display whilst in USA. On this date the aircraft passed from USAAF ownership but its location remained unchanged – Chicago Orchard Place Airport, Park Ridge, Illinois, used for storage of museum aircraft since late 1948. It appears to have been dismantled for storage by this date. Also transferred was a spare Napier engine sent out with the aircraft in 1944 – in 2016 this remained in store, complete and in good condition, with the Smithsonian Institution. Aug 1953 Letter in Air Pictorial (page 249) from Keith Boyer, who had seen `a Hawker Aircraft’ serialled MN235 – The Typhoon – at O’Hare International Airport, Chicago. Air Pictorial mis-identified the aircraft as a Hurricane, despite the correctly quoted serial number. The aircraft was stored for a future National Air Museum along with some 135 other aircraft. In the late 1940s, General Henry `Hap’ Arnold, Chief of Staff of the US Army Air Force, collected together sixty WW2 aircraft from all over the world and had them stored in an unused Douglas Aircraft Company factory at Park Ridge, Chicago, Illinois. However the aircraft – presumably including the Typhoon – were evicted when the factory re-opened in1952 with the on-going Korean War. The factory site later became O’Hare International Airport. After a period of external store the aircraft were crated by the time Mr Boyer saw them, and they were moved to the newly acquired storage facility at Silver Hill, Suitland, Maryland by early 1955 from whence the Typhoon was extracted in 1967. This is now the Paul E Garber facility of the National Air and Space Museum. Apr 67 RAFM request to Smithsonian for Typhoon to be returned to the UK. Aircraft prepared for shipment. Jul 67 Presented to RAFM by Smithsonian. Hurricane IIc LF686/5270M given in exchange by RAF 1969. 04 Jan 68 Shipped back to England from Baltimore to Liverpool Docks on S S Samaria. Taken by road to 71 MU Bicester for survey of work needed for restoration. 09 Apr 68 Transported by road by 71 MU to 27 MU Shawbury for restoration to display condition by a largely civilian team, restoration beginning 26 April 1968. Arrived in UK missing one 20mm cannon, spinner, most engine cowlings, starboard aileron, undercarriage parts, radiator/oil cooler unit, side panels below cockpit and various inspection panels. The missing cannon was replaced from RAFM stocks; the spinner was adapted from a HP Hastings spinner and other parts were made by 27 MU. The aircraft was in generally good condition with only slight corrosion. Replacement engine cowlings were made from sheet aluminium, and the missing radiator was replaced by a cut-down Bedford lorry unit made to look like the original from the front at least. The incomplete state of the aircraft delayed the restoration team who had hoped to have the aircraft ready for the Royal Review of the RAF at Abingdon in June 1968; the intended display of the aircraft on Horse Guards Parade September 1968 also had to be postponed. See Form 700 issued at 27 MU 19 November 1968 – DB351. 19 Nov 68 Restoration completed and aircraft formerly presented to Dr John Tanner of the RAFM by Wg Cdr D A Gifkins, CO of 27 MU. Aircraft remained in store at Shawbury. Photos: Aircraft Illustrated Feb 69 p.48; Aero Modeller Feb 69 p.63; Royal Air Force News 14 Dec 1968. Colour photos at Shawbury – Aircraft Illustrated Apr 71 p.151 and Wrecks and Relics – The album p.55; Hawker Typhoon Special Mach 1 (Thomas) p.13; Flypast May 2008 p.20. Feb 1972 Repainted by 27 MU at Shawbury. By Nov 1972 Moved to Hendon for Museum opening and displayed in Camm Hall area ever since. This area is now known as the `Fighter Hall’. 1994 Centrepiece of `D-Day’ display – some repainting scheduled. `Invasion’ stripes applied to wings and fuselage. Photos as latterly displayed – Aviation News February 2014 p.78; Flypast May 2014 p.10. 4 Nov 2013 Dismantling underway for move to MBCC RAFM Cosford for attention. Removal of the cannon fairings revealed traces of the original wartime paint scheme on the wing leading edge – yellow leading edge band, upper surface grey and even clearly delineated black underside stripes – original Typhoon identification stripes to avoid confusion with Fw190. 7 Nov 2013 By road to MBCC at RAFM Cosford. Photos as delivered – Flypast January 2014 p.7 and April 2014 p.32; February 2014 pp. 90-91; Wrecks and Relics 24th Edition (2014). Repainted in representative markings of a Typhoon of No 440 Squadron RCAF, codes I8-T; fuselage repainted by 10 March 2014. Photos of fuselage and wings; Napier Heritage News 83 Spring 2014-cover; Flightpath Vol 25 No 4 p.27, 2014. Nov 2013 Excavations by the volunteer Freeman Field Recovery team found the complete missing Typhoon Radiator core and at least one engine cowling amongst other buried aircraft parts, plus a complete Typhoon main undercarriage leg, propeller blades and other spares. Photo of radiator – Britain at War Magazine Jan 2014 p.12. 8 May 2014 Despatched by road to RAF Brize Norton en route to Canada for loan to the Canada Aviation and Space Museum, Rockliffe, Ottawa. Flown out by RCAF C-17 17 May 2014. Photo being unloaded – Classic Wings Issue 93 p.15. 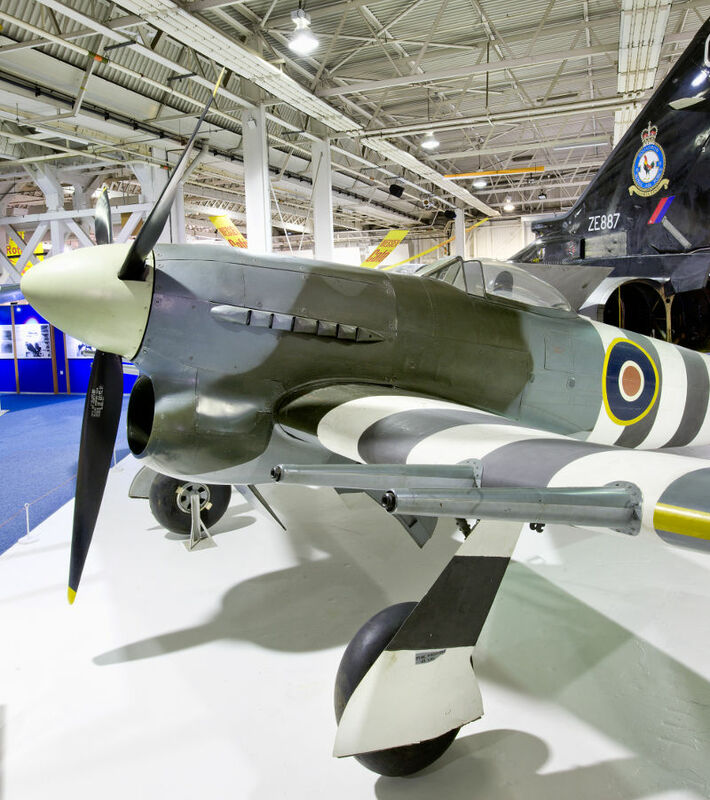 4 June 2014 Following assembly, towed from conservation hangar to main display hall at Rockcliffe. Formal unveiling on 6 June 2014 – 70th anniversary of D-Day. Photos on display; Flypast August 2014 p.16; Aeroplane August 2014 p.8; Flightpath Vol 26 No 1 (2014) p.6..
12 Apr 2018 Arrived back in UK via Liverpool docks. 18 Apr 2018 Following its return from Canada, to temporary storage at RAF Museum Stafford. 23 July 2018 By road from Stafford – Temporarily on loan to BAE Systems/RAF Coningsby. ‘Rolled Out’ at Coningsby on 27 July. Photos- Aeroplane September 2018 p.8. ; Aviation News September 2018 p.22; Britain at War September 2018 p.6. For display in BBMF hangar. For its 15th Show, Wings & Wheels is returning to its original 2005 spot in June! The airshow will now take place on Saturday 15th and Sunday 16th June 2019. The decision to change the date was made following the announcement that the Red Arrows will be on tour in North America throughout August and September and after consultation with exhibitors, participants, volunteers and visitors. The sensational summer event for the whole family, Wings & Wheels at Dunsfold Aerodrome, will be celebrating its 15th Show with a change in date to Saturday 15th and Sunday 16th June. Famous favourites in the air and on the ground will blow your mind, whilst the attractions and Zones in the Arena will keep you entertained and buzzing with delight the WHOLE weekend. Eyes to the sky as the ‘Wings’ of the event treats visitors to outstanding and diverse 5 hour air displays which have previously included show favourites the Red Arrows, Battle of Britain Memorial Flight (Lancaster, Spitfires), Chinook, Hurricane, the Tigers Parachute Display Team, The Blades, Jet Provost, Hurricane, Strikemaster, O’Brien’s Flying Circus, the Bronco Demo, Richard Goodwin, The Turbulent Display Team, B-17 Flying Fortress Sally B, NAHF Vampire Pair, NAHF MiG 15 and Fireflies Aerobatic Team, accompanied by witty and knowledgeable commentary from aviation experts and display pilots. 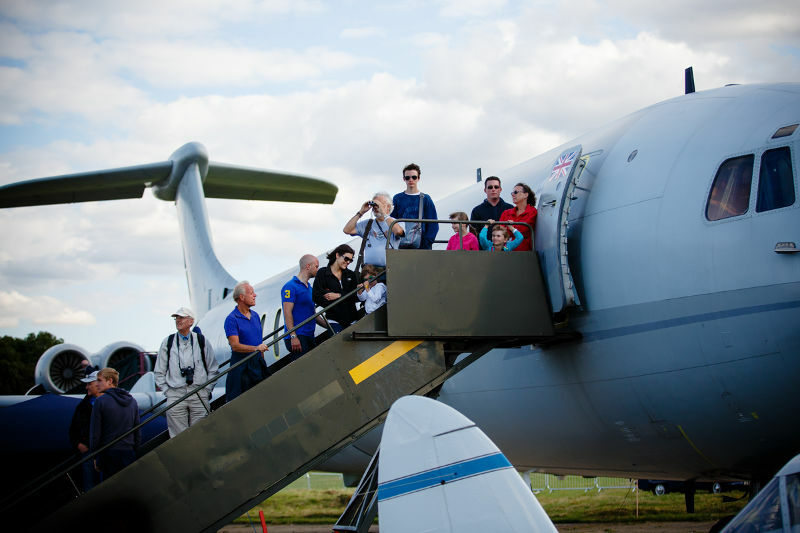 The ‘Wings’ of the event would not be complete without a close-up inspection of all the weekend’s visiting aircraft including Dunsfold’s resident Boeing 747 in the ‘Wings Park’ and Aces High DC3, all open for tours. Supercars and classic and vintage icons put on an awe-inspiring display of power and speed on the Top Gear track in a 2 hour auto spectacular. The ‘Wheels’ of the show included displays from Koenigsegg Agera R, McLaren 12C, Lamborghini Aventador Roadster and Huracan, Pagani Zonda, Ferrari California T, Aston Martin Rapide, Dodge Monaco, TVR Tasmin 280i, Ducati Multistrada 1200s, Ferrari F355 Berlinetta, Ford GT40 and Lotus Elise. The excitement and anticipation doesn’t stop at the main displays as the 32 acre public arena is bursting with a huge variety of interactive attractions containing all you need for a great family day out. The show arena boasts go-karts, aviation and motoring simulators, military outlets and displays, static aircraft, fairground and over 60 retail outlets selling a wide variety of products and gifts. Shopping in the arena includes a craft marquee full of tempting tea time treats to take home and craft gifts. As the last aircraft touches down the party starts across the arena with musical evening entertainment from Champagne at the Blitz, a 1940s songbird trio armed with smooth harmonies, seamed nylons and lots and LOTS of red lippy! Christmas has come early at the Royal Navy International Air Day HQ with news of the first confirmed participants! The Lithuanian Air Force will make its UK flying display debut with an L-39C Albatros jet trainer at Royal Naval Air Station Yeovilton on Saturday 13 July. The eastern European air arm is also reprising its popular 2018 static display contribution with examples of the C-27J Spartan tactical transport aircraft and Mi-8UTV Hip troop transport/search and rescue helicopter. The L-39 Albatros was a real success for Czech firm Aero Vodochody. During a 25-year production run, 2,900 were built and supplied to almost 50 militaries. Lithuania, plus around a dozen other nations, took delivery of the L-39ZA armed trainer/light attack variant. Its duties include surveying and defending Lithuanian airspace. The remarkable Mil Mi-8 (NATO codenamed ‘Hip’), winner of the Best Rotary Wing Static Display at Air Day 2018, is the world’s most produced-helicopter: a staggering 17,000-plus examples of the Soviet-origin design having been manufactured. Lithuania only employs three Mi-8s in the troop transport and search and rescue roles. 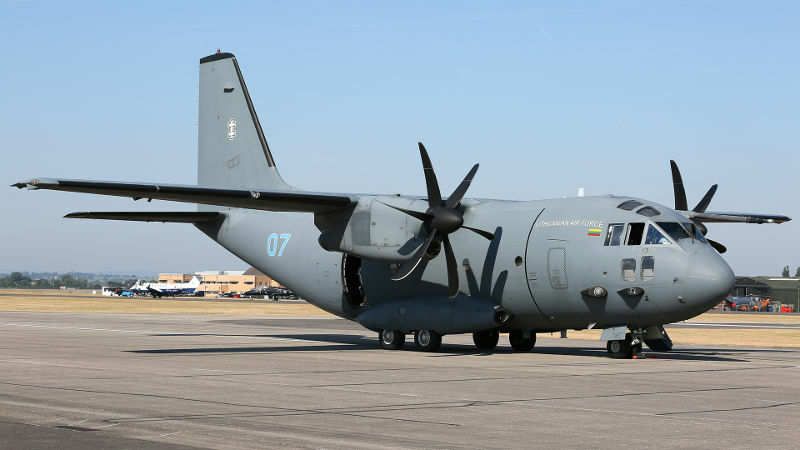 The C-27J Spartan is a versatile and highly deployable type that can operate from 2000-foot-long airstrips and has a very useful payload capacity of 11,500 kg. One of only three examples operated by this air arm, the Spartan was open to visitors at the 2018 show and proved to be extremely popular. These very rare contributions get the Royal Navy International Air Day 2019 participation announcements off to the very best of starts and we are sincerely grateful for the support shown by the Lithuanian Air Force. Early bird tickets with no booking fees are now on sale for a limited period only at http://www.store.yeoviltonairday.co.uk/. Aviation fans will have the rare opportunity to take seat inside the cockpit of the Cold War era British Aircraft Corporation TSR2 and get a close look inside the Second World War Junkers Ju88 at the final ‘100 Cockpits and Cabs’ event, taking place at the Royal Air Force Museum Cosford on Friday 7 December. 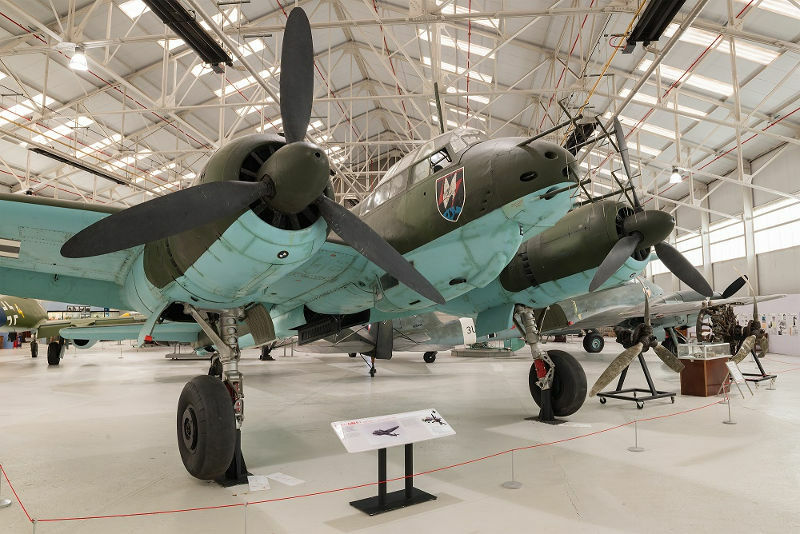 The event theme also extends to include a selection of the Museum’s War in the Air aircraft and vehicles and for the first time ever the Junkers Ju88R-1 will be open for close viewing. The Ju88 was the most versatile German combat aircraft of the Second World War, beginning life as a bomber, before becoming a night fighter and intruder; undertook anti-shipping operations and flew long-range reconnaissance missions. It was during the Battle of Britain, that Ju88’s played a major role in a number of daylight actions against British radar stations, airfields and ports. The aircraft was reasonably manoeuvrable for its size, and could take a great deal of punishment, however its lack of armoured protection and insufficient defensive armament meant that it was relatively easy prey for British fighters. At the time of the Battle of Britain the Ju88 was at the beginning of its service career and its remarkable adaptability, particularly as a night fighter, had still to be exploited by the Luftwaffe. 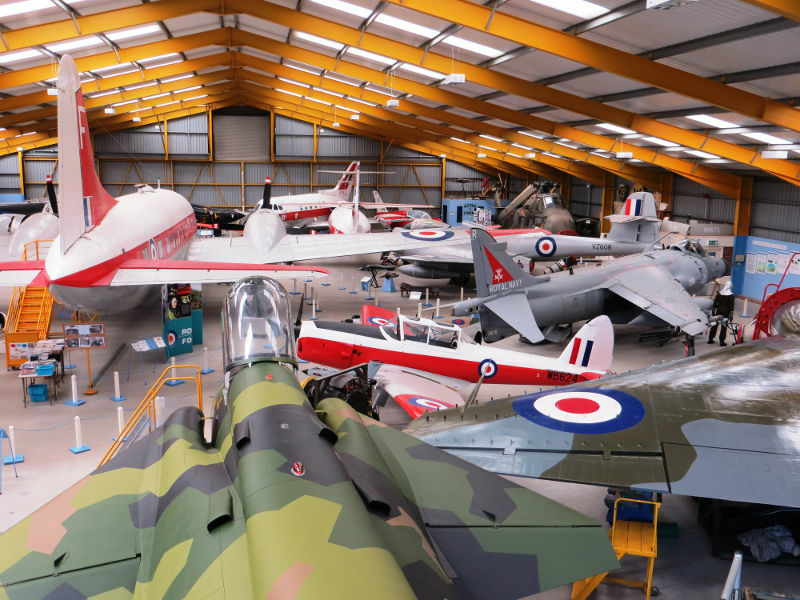 On Saturday 8th and Sunday 9th December 2018, we are offering a free admission to the air museum to National Lottery players. Newark Air Museum will be one of hundreds of participating National Lottery-funded visitor attractions across the UK saying ‘thanks’ to people who have raised money for good causes by buying a lottery ticket. The idea is simple: any visitor, who presents a National Lottery ticket or Scratchcard on Saturday 8th and Sunday 9th December 2018, will gain free admission to the air museum site. Back in 2003 we received £453,000 from The National Lottery. The money helped to pay for the construction of Aircraft Display Hall 2 on our Southfield Site. A newly-released DVD of this summer’s Royal International Air Tattoo has captured all the aerial thrills and action from the world’s most exciting airshow. 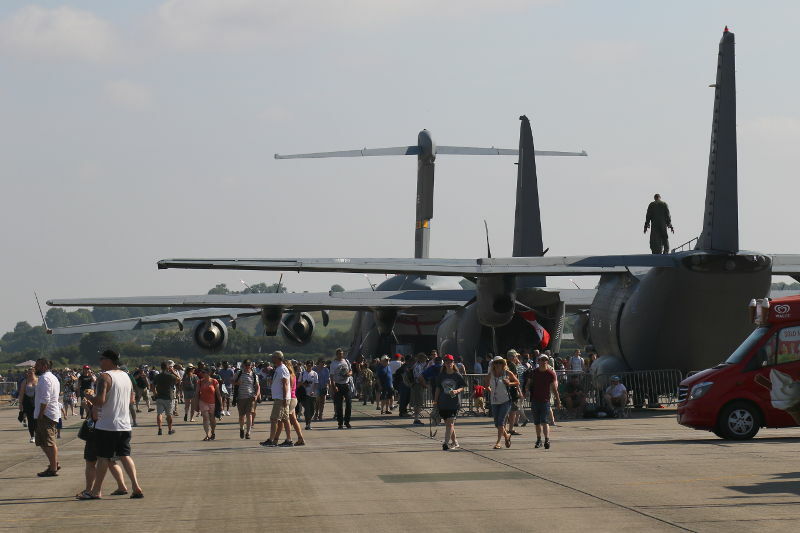 In total, 302 aircraft from 30 nations participated in the event at RAF Fairford in the Cotswolds, with more than 120 taking part in the flying display. Expertly shot in high definition and ultra-high 4K resolution by aviation film specialists PlanesTV, the Air Tattoo DVD/Blu-ray includes in-cockpit footage, behind-the-scenes features and pilot interviews alongside coverage of the extensive flying display, arrivals and departures. The focus of this year’s airshow was the RAF centenary and visitors to the three-day airshow were treated to a series of show-stopping joint flypasts to mark this special occasion. The RAF’s Battle of Britain Memorial Flight (BBMF) flew their evocative Trenchard formation comprising one of only two airworthy Avro Lancaster bombers in the world, a Douglas C-47 Dakota, Supermarine Spitfires and Hawker Hurricanes. Also featured on the DVD is the Diamond Nine formation of RAF Typhoons flown to mark RAF100 and the special tribute to the legendary 617 ‘Dambusters’ Squadron. This saw the BBMF Lancaster fly in formation with the squadron’s current aircraft, the Tornado GR4, and the RAF’s new state-of-the-art F-35B Lightning II. Among the flying highlights featured are displays by the US Air Force Heritage Flight; the Ukrainian Su-27 Flanker; the Royal Canadian Air Force CF-188 Hornet; the French Aeronavale Rafale M duo; the Italian Frecce Tricolori aerobatic display team and the RAF’s Red Arrows. Also captured is the surprise flypast by a USAF B-2A Spirit stealth bomber that had made the round trip from its base in Missouri, US. In-cockpit cameras give dramatic views of the action during many of the displays, including the RAF Typhoon, Patrulla Aguila, A400M, French Rafale, Turkish F-16, Finnish F-18 and the Swiss PC-7 team. The DVD features a number of special featurettes providing a fascinating glimpse behind-the-scenes at the Air Tattoo. These include a participant’s view of the airshow courtesy of the Royal Norwegian Air Force Historical Squadron plus the historic arrival of General Atomics’ MQ-9B SkyGuardian, the first civilian-registered Remotely Piloted Aircraft to land in the UK having made a transatlantic crossing. A Collector’s Edition is also available offering an additional two hours of action including comprehensive coverage of arrivals and departures and extended in-cockpit features giving a sense of the full display routines on board with 12 of the displays including Canadian CF-188, Finnish F-18, Greek and Turkish F-16. Sold in support of the Royal Air Force Charitable Trust, the official Royal International Air Tattoo 2018 Official Souvenir DVD is priced £25 (Blu-ray, £30). The two-disc Collector’s Edition DVD, featuring an additional two hours of special features including extended in-cockpit action, is priced £30 (Blu-ray, £35). A must-buy for aviation fans of all ages, the official Air Tattoo 2018 official souvenir discs can be purchased from www.airtattoo.com. Tickets go on sale for the Royal Navy International Air Day! 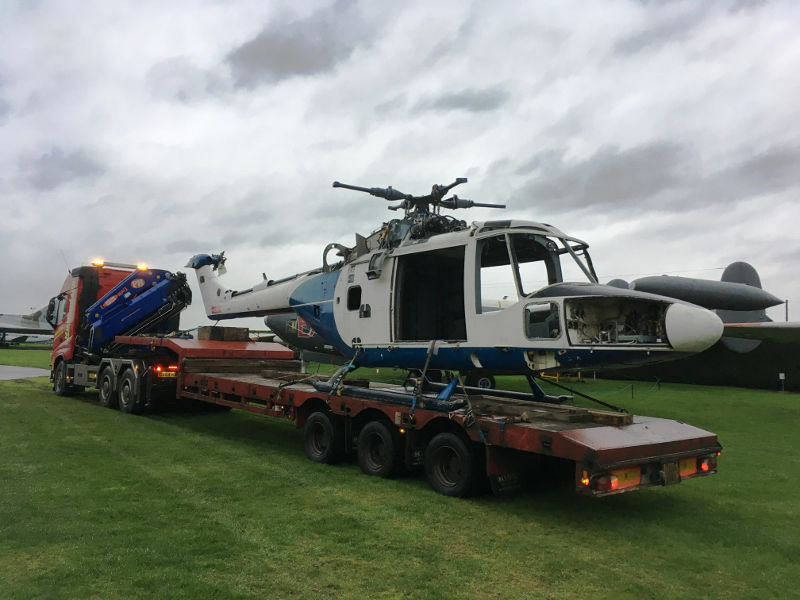 Friday 26th October saw the latest addition to Newark Air Museum’s collection of airframes and cockpit sections arrive at the museum site in eastern Nottinghamshire, close to the county border with Lincolnshire. Friday’s arrival was the cockpit section from Blackburn Buccaneer S.2B XX899. The cockpit was transported from its former display location in Coventry to Newark by Nottinghamshire based contractor Gillivers Haulage. The move was made possible thanks to the good offices of the managers at Coventry Airport who were kind enough to grant their permission for the cockpit to be lifted over their perimeter fence from its previous display location. 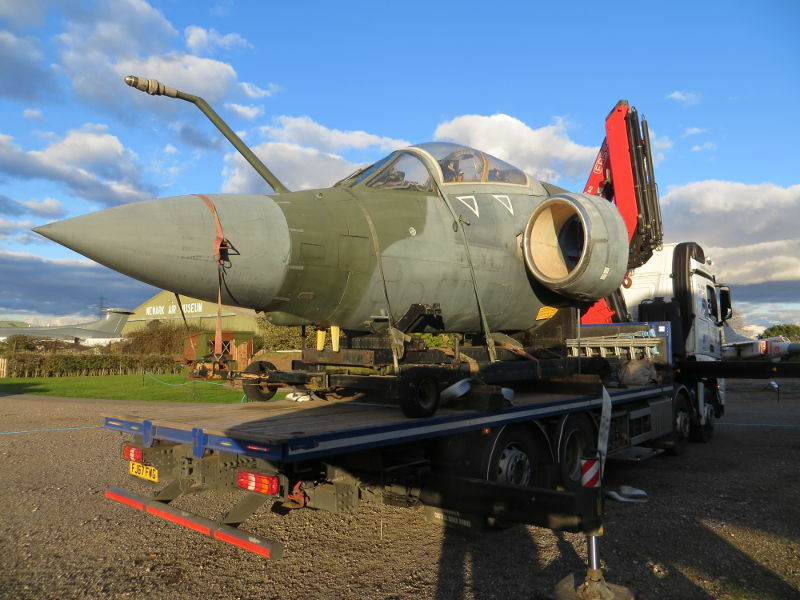 Owned by Robin Phipps, Buccaneer cockpit XX899 has been placed on long-term loan at the Newark Air Museum, where it will be displayed alongside several other cockpits outside Display Hangar 2 on the museum’s Southfield Site. These cockpits were recently repositioned to create sufficient space to accommodate XX899. A few panels have been removed from XX899 on a temporary basis and this is to allow them to be returned to display standard by the owner. One important feature of this particular Buccaneer cockpit is that it retains a significant section of fuselage structure, which allows the canopy to slide on its rails as per its original design. The trustees of the Newark Air Museum were happy to welcome both the Buccaneer cockpit and its owner to their Gateway Aviation Site in eastern Nottinghamshire. They are also pleased to report that the cockpit will be participating at their Cockpit-Fest 2019 event that takes place on Saturday 22nd and Sunday 23rd June, 2019.